Project SolarBot is a 2D action shooter with huge exploring elements! You are visiting planet Ers as a SolarBot. You can move freely in an open environment, but keep in mind that you have to take care of your energy level! Stay in the sun in order to prevent sudden shutdowns! Find rare materials and technology in order to save your homeworld and improve your equipment and your A.I. Wait... Maybe you don't even want to safe your homeworld? "Project SolarBot - An exciting metroidvania adventure needs your support! 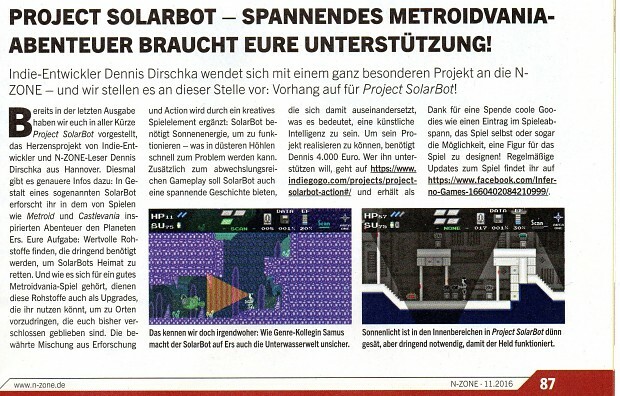 Indie developer Dennis Dirschka contacted the N-Zone with a very special project - and now we are presenting it to you: The curtain rises for Project SolarBot! We already shortly presented Project SolarBot in the last issue of this magazine. It's the heart project of the Indie Dev and N-Zone reader Dennis Dirschka from Hanover. This time, you'll get more details: As a SolarBot you are exploring a planet - inspired by Metroid and Castlevania - called Ers. Your mission: Finding rare ressources and materials which are needed so badly in order to save SolarBots homeworld. And just like in every good Metroidvania game, you can upgrade your SolarBot with those ressources and use them to reach new areas, you couldn't enter before. The well crafted mixture of exploring and action will be added by a creative gameplay element: In order to work properly, SolarBot needs solar energy - which could become a problem in dark caves. Despite a varied gameplay, SolarBot tells an exciting story, in which it'll be explained what being a A.I. really means, too. In order to realize this project, Dennis needs 4,000.00 Euros. Those who want to support him visit Indiegogo.com and recieve cool goodies as an appreciation. Like a credit entry or even the possibilty to design your own character for the game! You'll find frequent updates on Facebook.com."